Federal Express informed MIT on January 8 without warning it would no longer service MIT's accounts on a line-of-credit basis, Director of Purchasing and Stores Barry M. Rowe said yesterday. 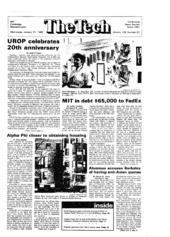 MIT had almost exclusively used Federal Express previous to the announcement. other members of the MIT community. "The announcement was unexpected since we had been working closely with Federal to improve our systems and procedures to enable faster payment of their invoices," the memo continued. "This is the first time a company that has serviced us so completely has ever taken such drastic action," Rowe said yesterday. A spokeswoman from the Federal Express office in Boston said that it is "not unusual for us to do that if we are attempting to reconcile statements." were owed more than 120 days before. He said the decision to terminate credit line service to MIT hinged on this early debt. reason for the slowness in payments. Airbills are necessary to confirm and trace shipments in the case of a missing account number. Moreover, account numbers that were indicated on the airbills "were not picked up by data entry people" at the Federal Express center in Memphis. In addition, many of the numbers that were entered were incorrect or garbled, Rowe said. traced after the debt started to grow, Rowe said. According to Rowe, Federal Express is a large operation, with "a lot of sloppiness in data entry." MIT is finding "a great many errors in [their] efforts to clean" up the accounting problems. The problem was compounded when MIT asked Federal Express to send back the airbills from the delinquent accounts, but the airbills sent "did not relate to the problem," Rowe said. MIT could not trace the account numbers, for many of the invoices did not even belong to MIT. Rowe added that "we are working extra-heavy now to resolve the problem." "Anytime you have a large number of departments shipping, sometimes it's difficult to reconcile the problems . . . we are working very closely with MIT," the Federal Express spokeswoman said, and "we are confident it is going to be worked out." As soon as word leaked out that Federal Express had dropped MIT's account, "all of the major carriers contacted us," Rowe said. He estimated MIT's annual shipments at $400,000 to $500,000 per year. Although Federal Express's treatment of MIT's account was unfair, according to Rowe, the account will probably be reinstated once the problems are resolved. In the interim, the Institute has been using DHL Worldwide Courier Express and Emery Worldwide, although if people "want to use Federal, they can use Federal," he continued. A spokesman for Emery refused to comment, and DHL did not return our telephone calls. "Federal Express is anxious to get us back. They are bending over backwards to get us back as an account," Rowe said. He said that Federal Express will still pick up and deliver packages, but bills may not be charged to an MIT account. Both DHL and Emery have been instructed not to accept a parcel if the accompanying airbill does not have an account number. "DHL has been doing a fine job; everyone seems to be using DHL, and is doing just fine," Rowe said. "I really want to get Federal Express back; they are open a lot later than DHL," commented Terri Lehane, administrative assistant in the Center for Transportation Studies. Federal Express picks up parcels much later than the other companies, making it convenient for late deliveries. "I'm hoping that MIT gets them back," she said. "DHL is good service, but Federal gives excellent service." Lehane said that MIT "should keep the two" companies. "They definitely shouldn't stop Federal Express." A source who wished to remain anonymous said "that [both MIT and Federal] tried to pin [the source of the problem] on the clerical help." The source said that while it was true "a lot of people" didn't put account numbers on the airbills, the design of the form was "pretty bad." "It was easy to send out a bill without one of the account numbers," she said.